Yesterday (on july 18th), a group of undergraduate & graduate students, scientists, professors and concerned citizens came together at USC’s Hedco Neuroscience Building’s conference room to discuss the global need for open science. Among the attendees were myself and Liz Krane, who not only support the initiative, but wanted to better understand the needs and opportunities for the Open Science movement. 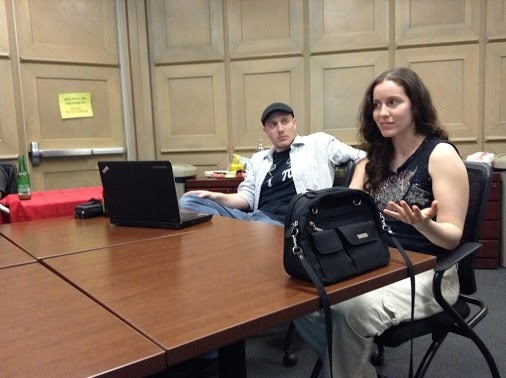 The meeting was coordinated by Célya Gruson-Daniel, the co-creator of Hack Your PhD out of Paris, France. She created a successful crowd-funding campaign to travel from France to the United States, bringing together students, researchers, engaged scientists, hacktivists, tinkerers, entrepreneurs and anybody else who are interested in the production and sharing of knowledge in a wider sense. Hack Your PhD was created in response to current ways of performing research frequently generating frustrations, conflicts and isolation, seeing a need to find a new and more efficient way to not only do science, but make sure that all results are available to other scientists and laypersons so that everyone can be better informed as to what science has already been done, what still needs to be done, and which ways it can be done better. The term “Open Science” is something that has been around for a few centuries, but is now able to be even more powerful with the amazing infrastructure available to exchange knowledge and data quickly. It’s a movement to make scientific research, data and dissemination accessible to all levels of an inquiring society, amateur or professional. This is not only limited to the publication process, which is already under a lot of scrutiny for not allowing everyone to access research articles unless paying a premium. Open Science also includes the need for all data to be available to those inquiring, so that more efficient methodologies can be created, duplicate research is not being performed needlessly, as well as enabling a more comprehensive database of relevant information to build off of. The two-hour meeting went long, but for good reason. A lot of conversation was being generated from people across many backgrounds. Tenured professors were engaging and discussing problems and their solutions with undergraduate students, with both sides providing amazing insights into the topics. Gathering together such a diverse group of people from a variety of technical and cultural backgrounds really allowed for creative and productive discourse to ensure as many angles of the issues were being discussed and laid the foundation for forward progress. Célya is heading up to San Francisco and then on to Seattle, continuing her journey to interact and engage with people from across the USA about Open Science. This is a great reminder that though we all have the ability to discuss these issues in the online forum, we also have a powerful way of tackling issues by getting together in person, meeting face to face, and creating solutions in a collaborative way (perhaps while having a nice meal and a glass of wine or two). I’m really looking forward to the next meeting here in Los Angeles which will happen in a few months, while also hoping to gather more people to come together from the area. Is Open Science something you’ve even heard of? And if so, what reaction do you have to it?